Hello guys, In this article you will find that how big companies like Airtel is doing misleading advertisements to make customers fool. This dirty marketing gimmick is now exposed. Airtel has announced a new data pack in which all customers will get free 4G data for 90 days in order to give direct competition to Reliance Jio welcome offer. This data pack is available for prepaid users only. This is very sad that there is no such offer for postpaid customers. When I check this Free data plan of Airtel, I found that new users can get Free 4G data for 3 months only when they do a recharge of 1494 and for old customers its 1495. You can see that the free is not actually free and you can see that Airtel is giving a whooping 1 Rupee discount to new customers. This plan is now available to Delhi/NCR customers. So, Delhi/NCR peoples Are you ready to enjoy Unlimited FREE 4G data.? I wonder that they are advertising Free data Pack, which is not actually free and without an asterisk (*) which should be there to indicate " Terms and Conditions Apply". This is not the first time Airtel is showing this cheapness in doing misleading promotions. Last month they advertised a 50Rs per GB data plan and then told that you have to pay Rs 1498 yearly. And If you are going to enjoy Free 4G data from Airtel you have to pay 500Rs per month roughly. So guys how can you say It is FREE when you are paying 500 Rs every month. This is clearly showing Airtel's fear of losing customers because of reliance Jio. Yesterday when People heard about this fake promotion of FREE data, many People started trolling Airtel on twitter. Check Few Pictures I found on Facebook & Twitter. Above Pictures clearly indicates that how bad Airtel customers are feeling with this FREE data. When i did more Research i found that This Free data is not unlimited, You will get 30GB only in 1495 Rs and the sad thing is after 30GB your speed will become 64Kbps which means 8 kilobytes per seconds. And guys we all know we can't do anything with 8 kilobytes per second speed. this speed is slower than what we are getting on 2G Internet. I am shocked how can a company tell its FREE when they are asking you money. Is there a new definition of FREE in Dictionary? If yes, then I would like to read that dictionary. Airtel is just playing with our emotions, being a 10 year old Postpaid customer of Airtel, I am feeling very embarrassing with this type of Advertisements and offers. So, guys, tell me is it really FREE? If yes, then why Airtel is asking us to pay Rs 1495? Airtel is also saying that it is unlimited, but we all know that its 30GB only. When people started asking questions about this unlimited plan, they told that its unlimited and after 30GB you can enjoy 64 Kbps speed which comes under Airtel's Fair usage policy. Now Airtel has been Exposed for doing Fake Advertisements. 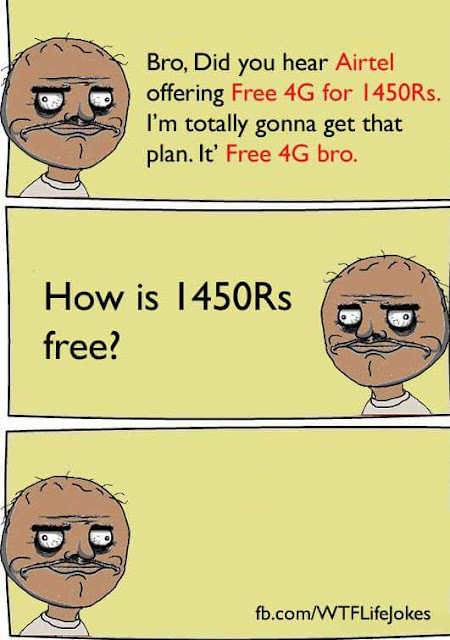 It would be better if they advertised as "Get 5GB data Free on a recharge of 1495 Rs with 25GB for 3 Months". Nobody wants to use a unlimited internet whose maximum speed is 8 Kilobytes. We all know if 8 kilobyte is maximum we will get speed below 8. I remember i started using Airtel's internet in 2008 and that time speed of 2G internet was 32 to 48Kilobytes per second. But after the 3G launch they reduced the speed of 2G to shift customers on 3G Network. Airtel is always known for using these type of tricks to earn huge. During Last 3 Months, Airtel is investing their money in negative promotion of Reliance JIO. 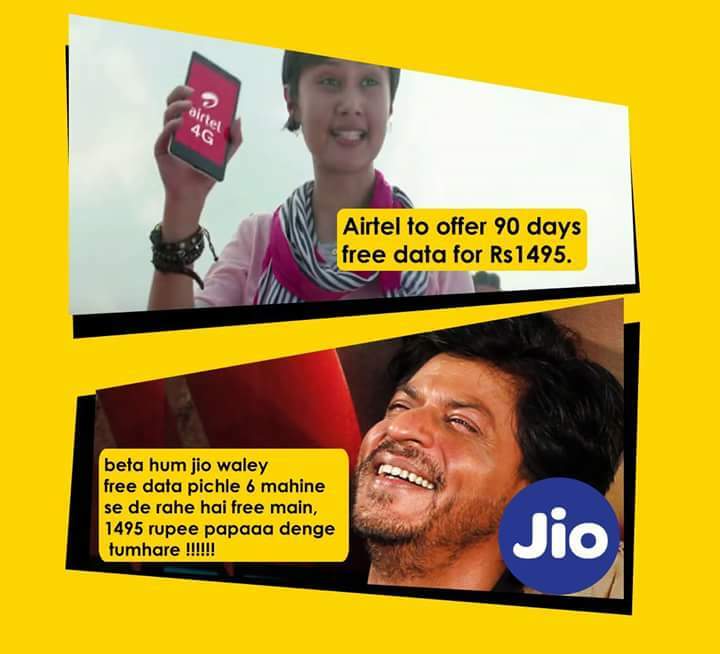 They launched this FREE data pack in direct competition to Reliance Jio. But we all Know there is No such terms and conditions applied on Jio users. All are using Unlimited data since last 4-5 months without a single limitation. I have seen people having reliance Jio SIMs are offering Free Internet to their friends and neighbors just by making HotSpot on their phones. So i can say reliance Jio is making relations more stronger. I bet you can't get HotSpot from your friend on Airtel. 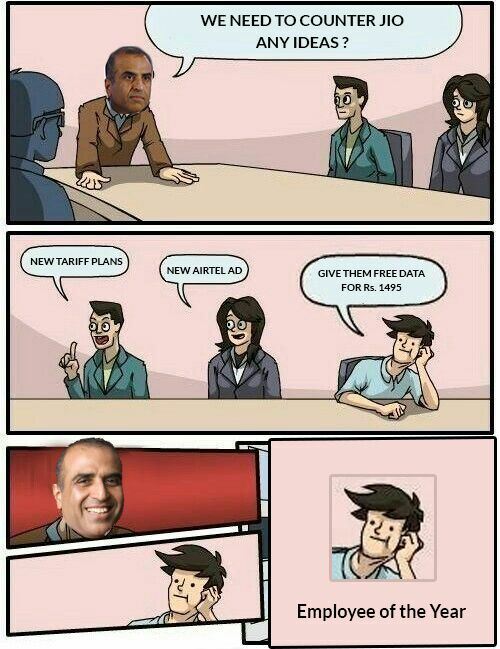 The Truth about Airtel's FREE & UNLIMITED data pack is now here. Airtel is now exposed for doing misleading advertisements. Its on you guys, whether to pay 1495rs for a free data pack or to use reliance Jio welcome offer which is truly free and unlimited. 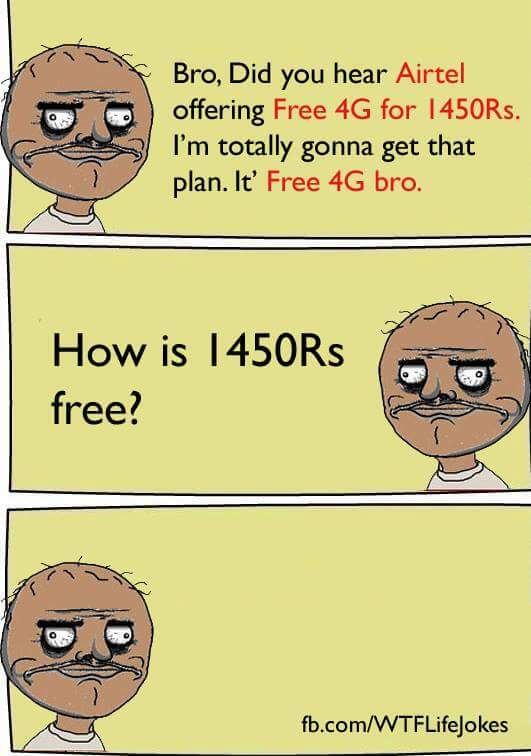 It will be better if you don't talk about getting FREE internet by paying 1495rs in front of your friends, as you will end up with laughter. Seriously guys, I can't stop my laughter whenever I think about this FREE Internet. One, direct question to Airtel, Why don't you offer good plans to your PostPaid customers? I have never got any offer from you in last 10 years. I have seen you giving free data to those who don't use the internet. Its a new way of advertisement.. fake advertisement more profit. It's a shame that companies like Airtel are using false advertisements to increase profit. Marketing efforts can be just as effective without lying to customers. If your ads are done well and target a specific segmented customer group, there's no need to lie.